Every spring I have many clients hemming and hawing if they should start this new project or plan a workshop now since it'll be schedule to launch in the middle of summer. I'm not sure if this is true everywhere, but in Seattle we definitely have this assumption that nobody does anything in the summer. From the way we talk about it, you'd think we all just hang out on the beach 24/7 May through August every year. This is blatantly not the case, and while the seasons do have an influence on business seasons, for many industries, it's just not that straight forward. There are certifiable seasonal and yearly events that do influence business: snowboards don't sell well in the summer, and gym memberships soar around New Year's. If you have a story about when your business does well and when it lags, that's worth examining. Is this a business season for everyone in your industry, or is it a unique pattern within only your business? I know many business owners who have some idea of their busy season or how their business cycles. But then again, I usually hear about someone's business seasons when there's been a disruption to whatever pattern they've identified. Is the pattern you've identified true for everyone in your industry, or is it a story you've made up to explain periodic business lulls? There's nothing inherently wrong with having a made up story to help you through episodes of slow business. To a large extent you need some kind of construct that will help you stay the course. Not every month is going to be a increase from the month before, and being in business for one's self takes a fairly large amount of steadfastness. You need some kind of faith to cling to that things will go up again next month or that things will pick up int the next business season. You need things like a soothing story that "this always happens this time of year." The danger of having a story is if it means you become complacent or loose your follow-through because of the business season you think you're in. If you're in a lull and you think it's just going to pass over without any action on your part, that's a dangerous place to be. A lull is a time to soar up to the 10,000 foot level and make an analysis of your marketing and sales efforts. Did you shift anything from last month or the last 6 months that might need to be shifted back? Do you have a healthy balance of new, referral, and repeat clients or is one lagging that you might need to focus on? If you find an obvious culprit then adjust and re-evaluate again next month all the while keeping yourself calm that this is how business ebbs and flows. Furthermore, if you believe it to be your slow business season, and thereby give yourself permission to not complete that project, then you're also shooting yourself in the foot. I've seen many a class or event do well in a time of year that it "shouldn't" have, and many small business owners surprised by an increase in business in an "unexpected" season. Rather than listening to industry-wide or personal trends, it's far more helpful to be tuned into where your energy is and where your community's interests lie. Your sphere of influence is likely to be much smaller than the whole industry, which means you can cater to what your people need and want. If you're a yoga teacher who's hearing from students that they want an early morning yoga class, you may consider with pause that the rule of thumb in yoga is that summer is a quiet business season. But your people are saying they want this, so it's far more important to listen to your ground swell! And if you're not as face-to-face connected with your clients, then listen to the ground swell in your heart. What do you want to be offering? Moving with your own energy makes you more compelling to your audience, no matter how you deliver your message. If people aren't interested in what you're offering, it might be the season, but it could be a million other reasons. No matter what the season, there are always ebbs and flows in business. You can weather periods of slow business by staying true to yourself, your goals, and the needs of your community. 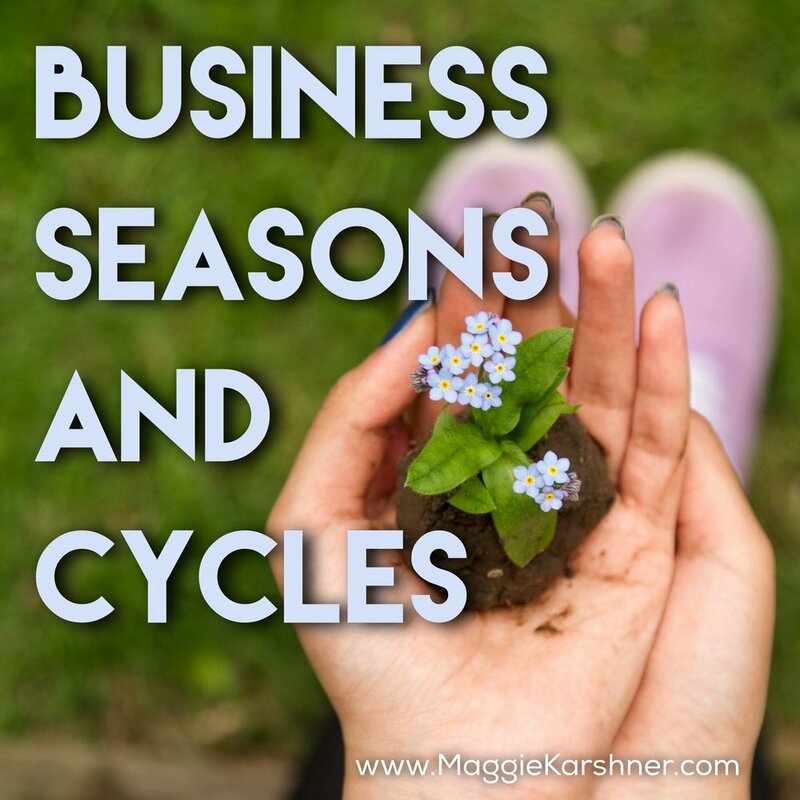 So the next time you consider not doing something because it's the "slow season," pause for a moment and re-examine your notion of business seasons.